What is this “spatula” called, and what is it for? I have this "spatula". The split in it perplexes me. It was inherited from a roommate who left it behind after moving out. It has a partner, that is a bigger spatula/flipper, with a hole in the middle. While the hole is large enough to be occasionally annoying, there doesn't seem to be anything abnormal about it. Based on the shape of the handle (and compared to the other (not pictured) spatula), the surface in the photo would be the "top". Those could be a salad set, similar to this one. The two "spatulas" might be combinable to form a set of tongs. Update: Salad sets generally contain a forky and a spoony component, which may or may not be combinable (and there are e.g. combinable pairs of spatulas). On the other hand, shapes vary widely, and there are two-spoon and two-fork sets, and maybe whoever designed this wanted to create a multipurpose tool (considering the straight lower edge). This is "multi purpose" spatula. Sometimes called "better spatula" but that may be brand name. It's usually used for mixing, cleaning beaters (as in removing what is on the blades into the bowl), flipping and spreading. I use it when I have to do many cooking task to do at once. You just wash it quickly with water and can use it again. Save time and place on the counter. It looks plastic to me but I had a similar tool that was made of wood and it was used to push the oven rack back into the oven! Not the answer you're looking for? Browse other questions tagged equipment utensils or ask your own question. What is a 'dough spatula'? 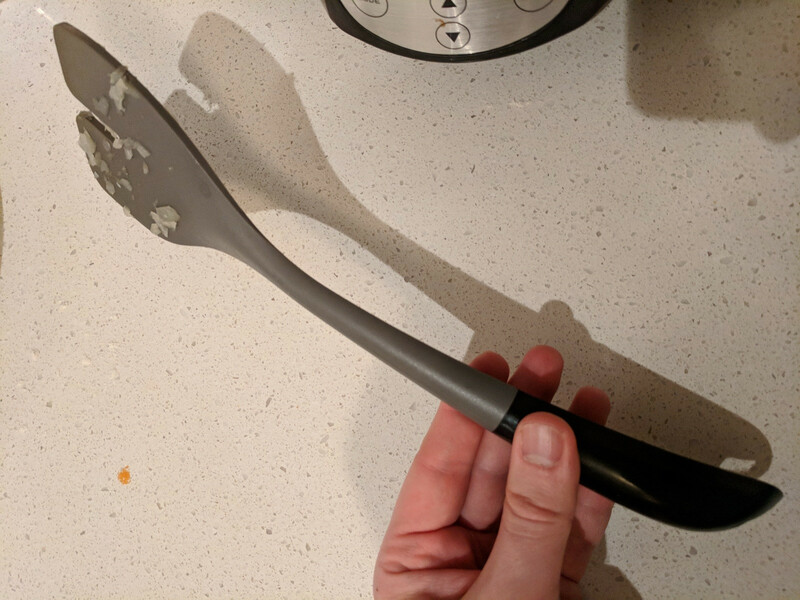 What is this spoon-like kitchen utensil with a rubbery head and wooden handle called? What is this plastic handle that is used for corn and watermelon called? Where can I find this exact spatula, with a short handle and asymmetric head? What is the “honey stick” called? What is this attachment for on this veg peeler? Does anybody know what company made this spatula?